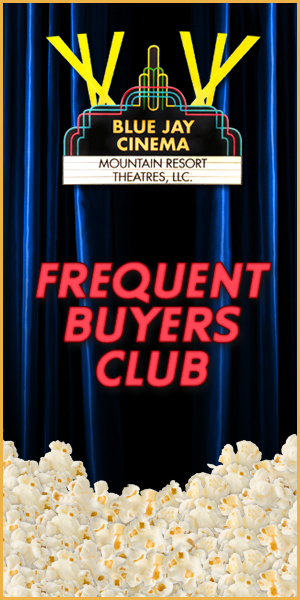 Sign up for our frequent buyers card at our box office. It’s free and the more movies you see, the more free movies and popcorns you receive. If you like, we can swipe your drivers license so if your card is lost or forgotten, you can still get points or get a new card. Each movie ticket you buy gets you one point (free tickets do not earn you points, you can earn up to three points in a day). Sign up online or at our box office. Earn 1 point for every dollar spent at the box office and concessions stand. We use a “rolling expiration date” for the rewards that you acquire. Your rewards will expire 1 year from the date you earn them. Any new rewards earned in the future will expire 1 year from the date they are earned, and so on. Points work as “milestones.” Get a reward at 75 points, stay at 75 points to accumulate more. You may not earn points when using a Blue Jay Cinema Gift Card for your purchases. Free Ticket Rewards cannot be redeemed for “Special Engagement” or those prohibited by contractual obligations. Points can only be added to an account at the time of purchase. Due to any unforeseen technical failures that would prevent the earning of points or redemption of rewards, Members are not entitled to compensation. Blue Jay Cinema reserves the right to change or cancel the program at any time. Membership, points, and rewards are not transferable to another person or membership account. If you have any questions email us at BlueJayCinema@gmail.com or come to our box office. By becoming a Member of the Frequent Buyers Club (“FBC”) you agree to all the terms and conditions set forth below. Members must be 13 years of age or older to apply. Blue Jay Cinema has the right to change the terms or cancel the FBC at any time and effective immediately as posted on the website. For up-to-date program details, please visit www.bluejaycinema.com. Membership points and rewards are not transferable to another person or membership account. Points will be issued to only one membership account per purchase. Your address and email will be used solely by Blue Jay Cinema for the purpose of sending marketing communications pertaining to Blue Jay Cinema. If you choose to opt-out of such communications, please notify us at info@bluejaycinema.com. All notices regarding the FBC will be posted to the website and may also be communicated via email, regular mail, or at the theatre. Members begin earning points after account activation. A valid FBC card must be presented at the time of purchase of tickets and concessions for points to be earned. Free ticket rewards cannot be redeemed for “Special Engagements” or those prohibited by contractual obligation. At the concession stand, Members earn 1 point for every dollar spent. Card may be used only one time per visit for concession purchases. Points will continue to accumulate on the membership card but will have a rolling expiration date. That means any points you earn, expire 1 year from the day you earn them. Any new points earned on your next visit will expire 1 year from that day, and so on. Once enough points have accumulated on the account to earn a reward, the available reward will be added to the card automatically. Member must accumulate 75 points before redeeming their first reward. Rewards can be redeemed at the box office or concession stand as rewards become available. If rewards are available, a Member may or may not choose to use the reward at the time of purchase. Any redeemed rewards will be immediately deducted from the card used during the purchase. Once rewards are earned, they will remain available for 1 year from the date earned. Any unused rewards after 1 year will be forfeited. Blue Jay Cinema has the right to terminate a membership at the sole discretion of Blue Jay Cinema and its staff if at any time a Member is violating the terms of this agreement. All points and unredeemed rewards will be cancelled from that Member’s card. If at any point a Member wishes to cancel their membership in FBC, the Member must notify Blue Jay Cinema via email at info@bluejaycinema.com or via US Mail at 5313 Quakertown Avenue, Woodland Hills, CA 91364. As a Member of the FBC you agree to indemnify and hold Blue Jay Cinema and its owners, partners, employees and affiliates harmless from any claim or liability due to participation in the FBC or use of the Blue Jay Cinema website. Blue Jay Cinema is not responsible for Member’s ability or inability to use the FBC or website. Blue Jay Cinema is the sole proprietor of all content relating to the website, marketing materials and email communications for Blue Jay Cinema and the FBC. All content cannot be reproduced or distributed without written consent from Blue Jay Cinema.